This extremely effective and economical deodorant crystal Roll on is 100% pure and natural with a fresh ocean scent. It is hypoallergenic, provides 24 hour protection, and is non-staining. 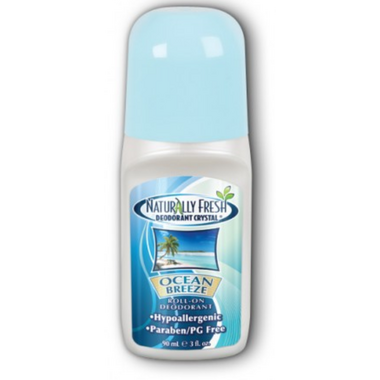 Naturally Fresh Deodorant is highly recommended by doctors- oncologists, dermatologists, and allergists. Ingredients: Aqua, Potassium Alum, Zinc Ricinoleate, Xanthan Gum, Anthemis Nobilis Flower, Phenoxyethanol. I found this to be a good product, however, despite the fact that it claims to be hypoallergenic, I had a reaction to it after two days with redness and itching. Although obliged to discontinue using it, I'm sure many others may not react to it. You'd have to try it.